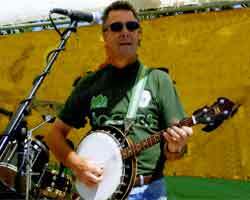 Burtie has played with many musicians and different bands. then click on their name to hear the quality and musician ship of their playing. I started playing music while still at school (about 15years old) when I aquired a ukelele banjo for half-a-crown (12.5p) I learned to play from the song sheets of the day where the chords are shown in little diagrams, tunes like Swannee River, when I'm Cleaning Windows etc. My mother was not a great music lover and I used to practise in a nearby field where my first groupies were a herd of cows who used to form a circle around me and sway to the rhythms of the uke! 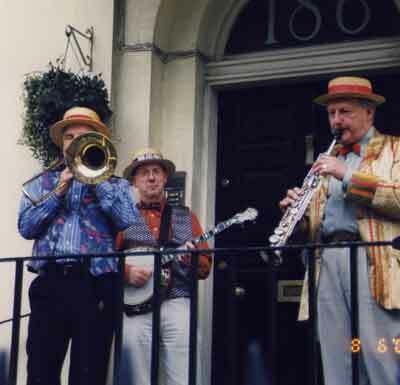 One day there was a knock on the door and the visitor said he had heard that I was a banjo player and would I like to join his jazz band. 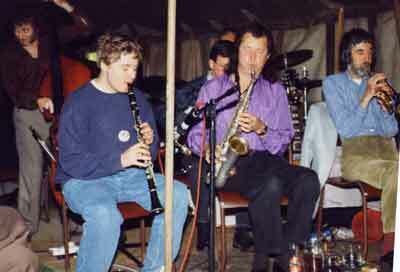 At the time I thought jazz was Ted Heath! 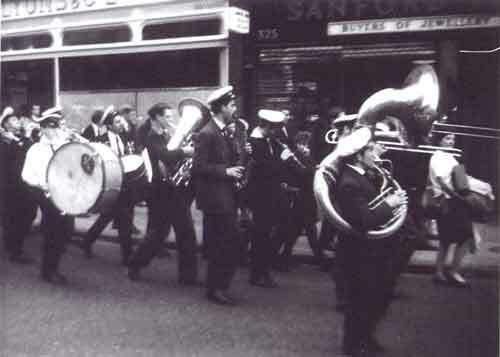 That band was known as the Tishomingo Stompers and eventually became reasonable proficient and popular in the East Kent area particularly at the Bear and Key, Whitstable, Kent where we ran our own club. I then went to college to study chemistry continuing to play including a stint with the college band. 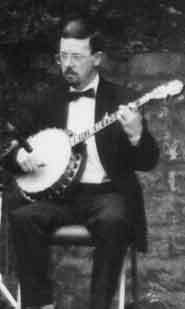 I moved up to London, sold my banjo until approached to join a band managed by Harold Davidson to cash in on the Trad boom (about 1960). 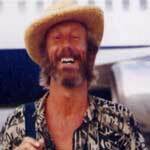 I was auditioned on my only instrument at the time, a classical Spanish guitar where I had to play Sruttin with Some Barbeque. I got the job, bought another banjo and away we went, where being the only driver in the band I got £5 a week extra for driving . 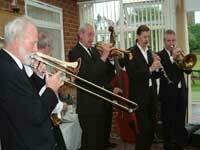 That band folded and I gave up playing jazz, got married, pursued a career etc. 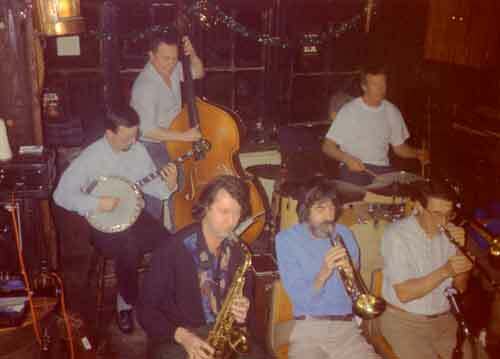 Years later (1975) the Mo Hovery Jazzmen needed a guitarist for a job on a boat. 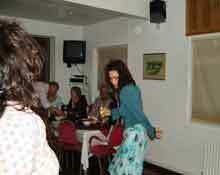 I did the gig, joined the band and away we go again. 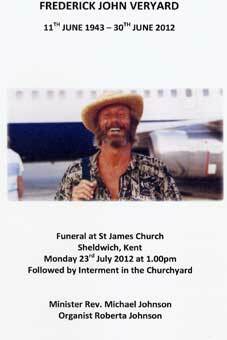 Since then I've played in a lot of Kentish bands - Invicta, Preservation Stompers ,Pete Rose Jazz Band, Bill Barnacle Jazz, Dave Link's Band culminating with several years touring the highways and byways of Europe with Max Collie until forced to give up the heavy duty travelling due to ill health. Now taking it easy with local bands and also Bob Dwyer's Hot Seven band. 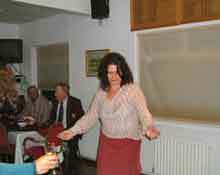 plus a member of the Ginger Pig jazz band and did tours with Sammy Rimington. 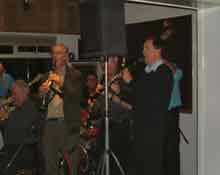 Monday Night Jazz Band at the Sun, Bredgar - plus whoever rings him. To receive more information on Lake Records send a SAE to: Lake Records Production, Workington, Cumbria, CA14 3EW U.K.
Geoff Cole tbn, Gerry Card drms and an unknown Bass playere. 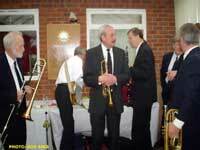 trumpets : Jim Holmes, Mick Stansell and Brian 'B' Minter and yours truly on bass drm. 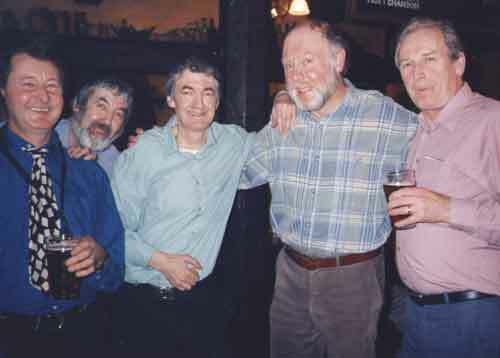 Eric bass drum, John Defferary alt, Bill Cole sousa, Mike Pointon tmb. 'B' Minter tpt, and Jim Gunton tbn. 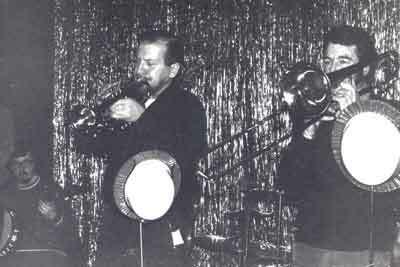 Sammy Rimmington, The Minter bros, trombonists Roy Maskell and Jim Manning. 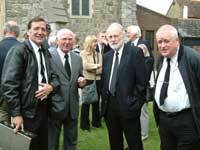 Reg Rigden, Eddie Harvey tmb and Art Streetfield sousa. The movement Webb created, which grew steadily in the late 1940s, led directly to the "trad boom" of the late 1950s and early 1960s in which he also played a leading part, first as pianist and bandleader and later as agent and promoter. George Horace Webb was born in Camberwell, south London, on October 8 1917, the son of a music hall artiste. His earliest memories were of his father and uncle (the "Brothers Webb") rehearsing their act at home. The family later moved to Belvedere, Kent, and Webb took a job at the Vickers Armstrong armaments factory in nearby Dartford. 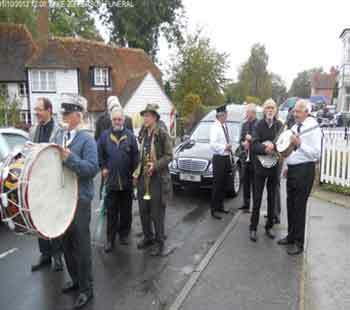 In 1941, the band acquired a name: "George Webb's Dixielanders", and a regular place to play – the downstairs bar of the Red Barn pub in nearby Barnehurst. 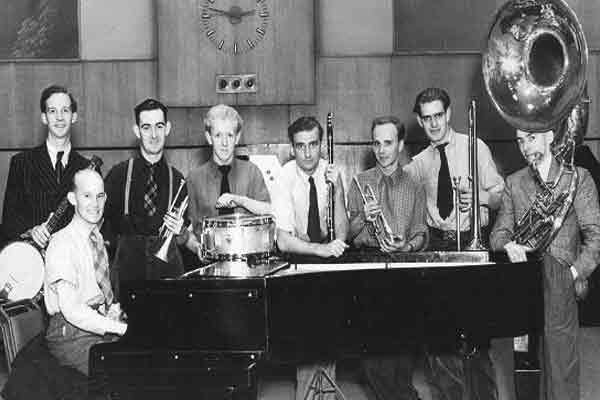 Modelled on King Oliver's Creole Jazz Band of 1922 to 1924, their music sounded alien, even barbaric, to ears brought up on crooners and English dance bands. 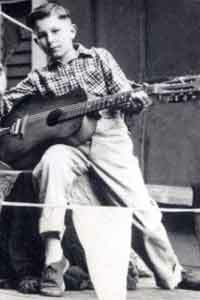 Webb was fond of recalling the band's first appearance at the Red Barn: "By the time we had finished the first number we were playing to about ten people, the other 50 having fled to the saloon bar upstairs." A sometimes pugnacious character, he once defended the band's honour from a mocking onlooker by striding off-stage mid-performance, landing a heavy blow, then returning to the keyboard. But the word gradually spread, and over the next six years jazz devotees converged upon their unlikely suburban stage to enjoy the unique experience of hearing jazz in the classic style played live. 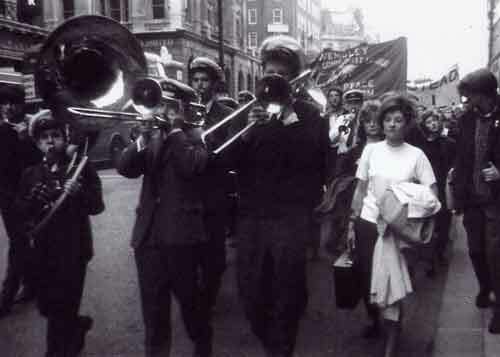 One such visitor was Humphrey Lyttelton, newly demobbed Grenadier Guards officer, first-year art student and aspiring jazz trumpeter. He sat in with the Dixielanders and was soon invited to become a permanent member. As the style took off in the postwar years, a growing network of venues, along the lines of the Red Barn, became established around Britain. There were features in the music press, occasional radio broadcasts, and even recordings. 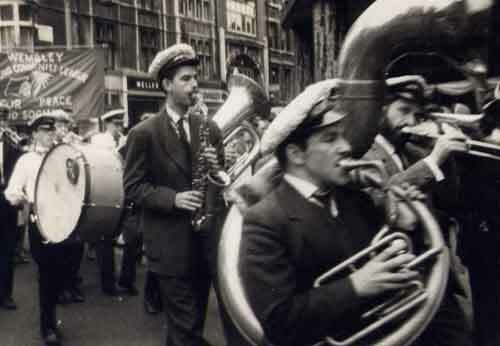 In 1948, with its members scattering in search of employment, the Dixielanders folded and Webb joined Lyttelton's newly-formed band as pianist. Partly as a result of Webb's pioneering work, Lyttelton quickly found a new audience among the growing student population. In place of the beer-sipping aficionados of the Red Barn, his band played for crowds of youthful dancers at venues in central London, and later around the country. It also recorded prolifically, with Webb's effervescent piano often featured. He was a small man, with tiny hands, which Lyttelton said reminded him of a pair of kittens, scampering up and down the keyboard. In 1951, observing the growing popularity of revivalist jazz, Webb thought it a good moment to branch out into promoting jazz events. The most successful of these were the Sunday night sessions at the Shakespeare Hotel, Woolwich, which played to packed houses until the early 1960s. In 1955, Webb joined the staff of Jazzshows Promotions, booking bands and singers for the ever-expanding club and concert circuit. 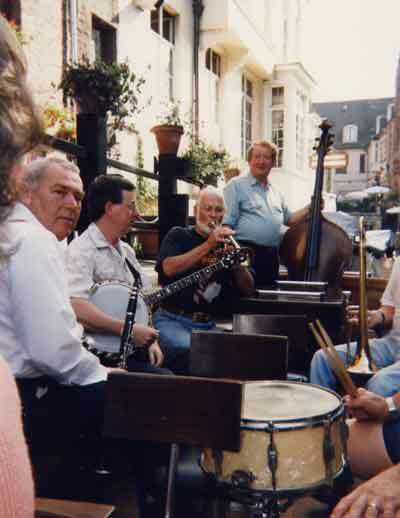 Leaving Jazzshows after 10 years, he set up his own management and agency business, numbering rhythm and blues groups as well as jazz bands among his clients. 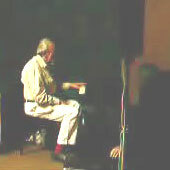 Webb barely touched the piano during these years, but returned to playing in the early 1970s. 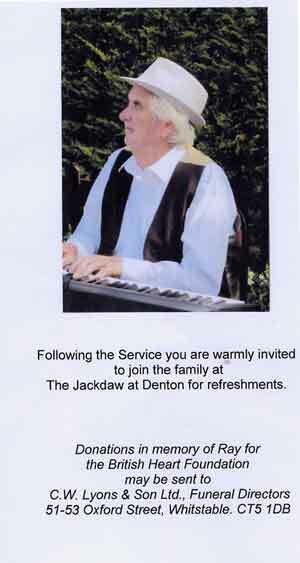 He toured Europe as accompanist to the singer Jo Starr and, in 1973, briefly formed a new version of the Dixielanders. 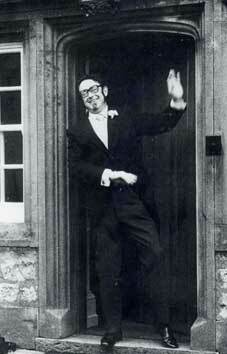 In 1974 he took the tenancy of a pub at Stansted, Essex, a move which enabled him combine all his various activities. 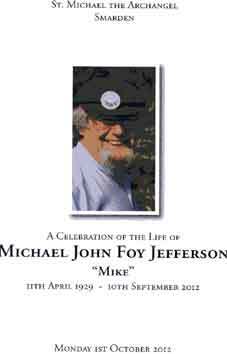 He ran the bar, booked the entertainment and sat in with visiting bands whenever he felt like it. 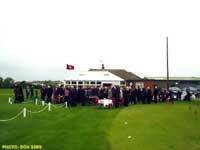 In 1985 Webb gave up his tenancy and moved back to Belvedere, close to the scene of his early triumphs. On July 4 of that year he was guest of honour at the unveiling of a plaque at the Red Barn, commemorating his contribution to British jazz. Although officially retired, he resumed playing with gusto. He appeared as guest artist with many bands, formed several temporary outfits of his own, and was always the first to volunteer to perform at a charity event. 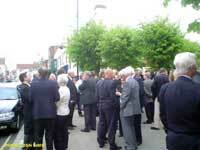 In 1998 he took a prominent role in the celebrations of Humphrey Lyttelton's half-century as a bandleader. 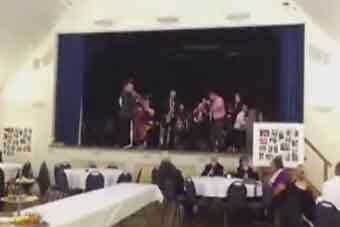 He continued to play occasionally until the end of his long life and was due to appear, in May, at a show to celebrate the 70th anniversary of his first venture in band leading. 1956 - I was 12 years old and had always loved music but the lessons I'd had on violin and piano hadn't quite done it for me. Then all of a sudden there was skiffle and rock & roll and everything changed overnight. I wasn't sure whether I wanted to be Lonnie Donegan or his guitarist Denny Wright - or maybe Bill Haley or his guitarist Franny Beecher - but it was definitely one of them. 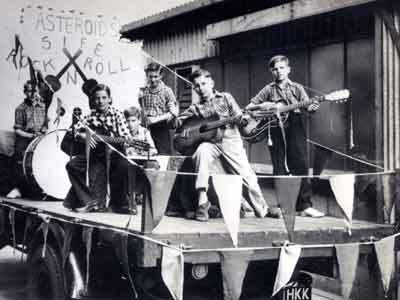 The following year I formed a skiffle group, The Asteroids, and entered the Dover Carnival. That's where I first met Bod Bowles. 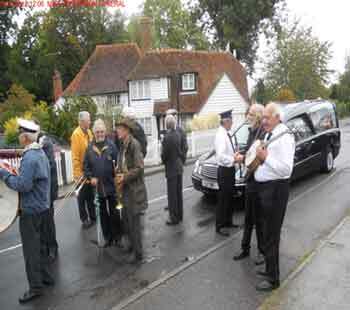 His jazz band was following us in the procession drowning out our feeble sounds! In 1958 the BBC started to broadcast 'Guitar Club' and I was inspired by the playing of players new to me - Ken Sykora, Ike Isaacs, Dis Disley and many others. 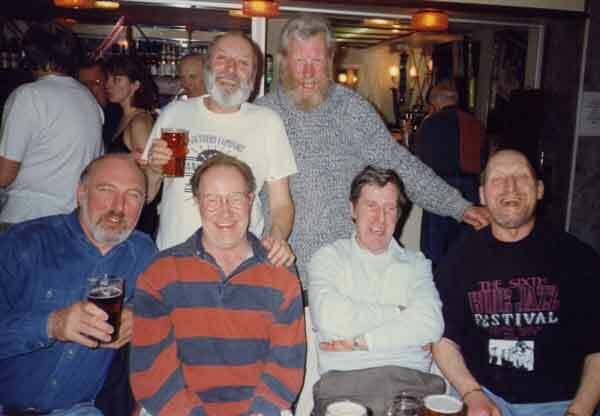 The skiffle group folded and I joined first a local dance/jazz band (The Melody Makers) and then the original Rolling Stones (the Dover-based group which had started out as a skiffle & blues band in 1956). 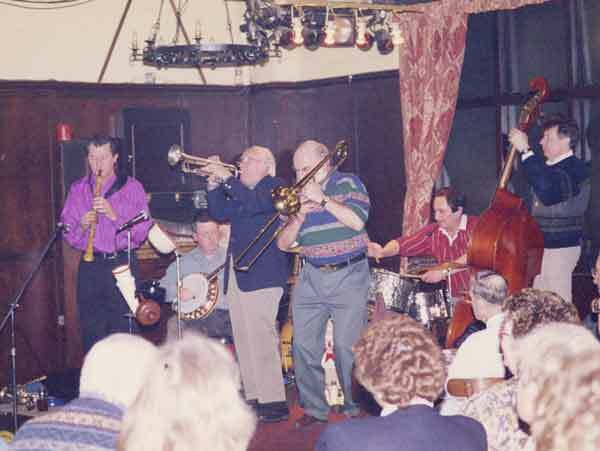 Bod took over the Grapes (Louis Armstrong) and when the jazz sessions started I'd go along and soak it up, eventually plucking up the courage to join in. I guess that's when it finally dawned on me that it was the instrument I'd fallen for rather than any one type of music. 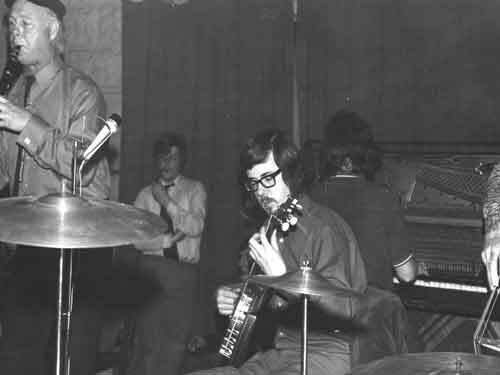 Next came some years in the house band at Tofts Jazz Club, Folkestone, supporting and playing alongside some great musicians like Georgie Fame, John Mayall, Clapton etc. 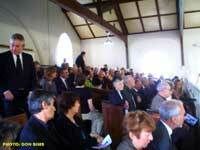 and also accompanying visiting variety artists. 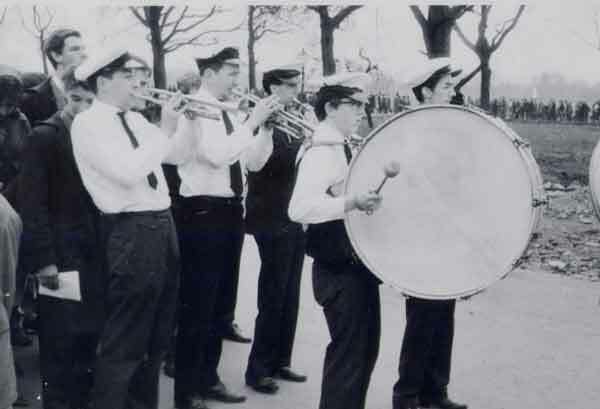 I was never a 'regular' member of Bod's band but often helped out, playing whatever they were short of - usually either banjo, guitar bass or drums. That's how I met Bill Barnacle and went on to play with him in both his own band (1975) and in Whirligig (1977) whilst keeping my own outfits going throughout the 80s and 90s. 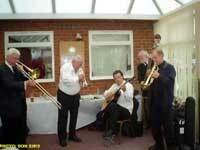 Since 2006 I've been reunited with Bill, playing banjo and guitar in his band as well as with the Stour Valley Jazzmen. I still do a few other things as well - some Irish banjo here and a bit of gypsy jazz there - and I love it all as much today as when I first started out! I first became interested in music listening to my father playing piano, and so I went to piano lessons for a few years, and also I was influenced by pianists like: Fats Waller, Art Tatum, Oscar Peterson etc. Also I like all the 40's, 50's swingbands - Basie, Ellington, Shaw, Goodman and in particular I loved listening to the Benny Goodman trio's and quartets etc. There were many solo players influenced me like Errol Garner,Ben Webster, Satchmo of course and Clark Terry. 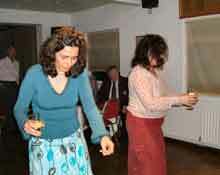 Many English bands caught my attention like Dankworth Seven , Alex Welsh and Ted Heath. Over the years I have collected records of all these artists and indeed I do still listen to them from time to time and I must say there are a lot of local players I have enjoyed gigging with over the years so all in all music has played a big part in my life and hope I can go on playing for a few years ' who knows' I may be lucky. 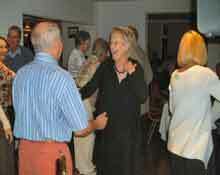 At the present time I play in Lyn Falvey's Touch of Class who sings all the jazz standards, and I do have quite a variety of bands I gig with so all in all I enjoy it all. 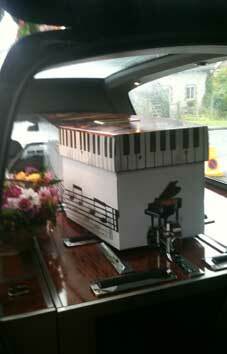 and yours truly Ray Perkins piano. 2000 and playing in between with many other bands. 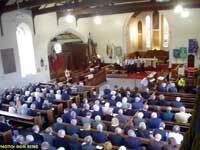 he had a great send off at his funeral at St James Church, Sheldwich, Kent .